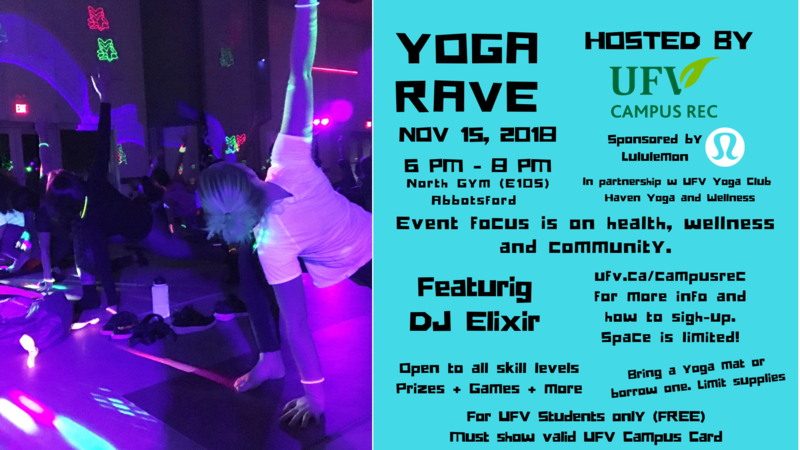 This is one of the hottest events at UFV!! Formally known as Glowga. 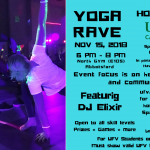 This high energy event will feature black lights, glow in the dark body paint, fun mixing and mingling pre-event activities and of course yoga; but this year we are adding a few new things! We are happy to present DJ Elixir who will be spinning LIVE tunes throughout the night. Lululemon, Haven Yoga and Coke-Cola are all sponsors and we have FREE STUFF to give away from them too! This event is suitable for all fitness levels. Please RSVP on the myCampusLife.ufv.ca, link on our website, if you plan to attend. We will have mats to borrow, only while supplies last. If you have your own yoga mat, make sure to bring it. More information about the event is online.